I happen to be an exchange student in beautiful Taipei, Taiwan. 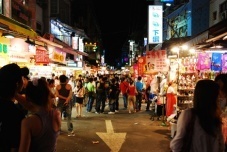 The place where I'm living also happens to be right outside the biggest night market in Taiwan. I go there almost everyday and figured it would be cool project to try and capture the craziness that are night markets. Looking forward to the class! Not quite at the sketching stage, but hopefully I will be able to work something out tomorrow. One thing I want to incorporate is the chinese character for thing; dongxi 东西. Broken down, dong means east and xi means west, but put them together and you get the character for things. I think this is a great representation of shilin and would love to incorporate that into the logo in a creative way.